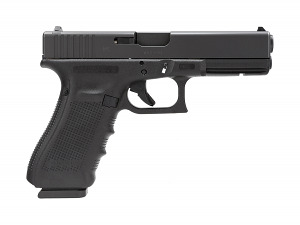 The Glock 22 GEN 4 .40S&W with standard fixed sights. This new generation of Glock pistols comes with a modified grip, smaller to meet the demand of shooters with smaller hands. The grip is more aggressively textured than standard and is ergonomic and adjustable with two additional backstraps to increase the grip size for those that require a larger grip. A new dual recoil spring assembly is installed to provide higher reliability and longer service life. Comes with all of the usual factory accessories, including box, manual, lock and three 15 round magazines.